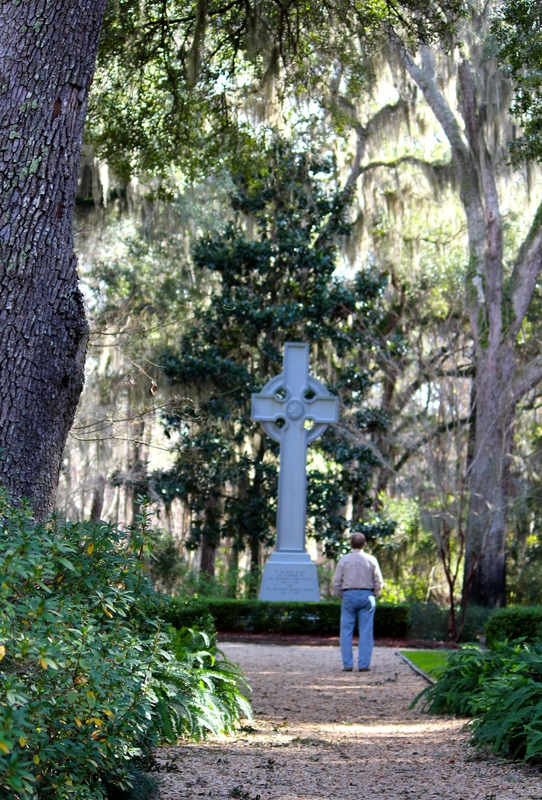 Coasting: The serenity of Christ Church on St. Simons Island | Oh, the Places We See . . . Known as one of America’s most beautiful churches, Christ Church offers a serene place of worship on St. Simons Island, Georgia. 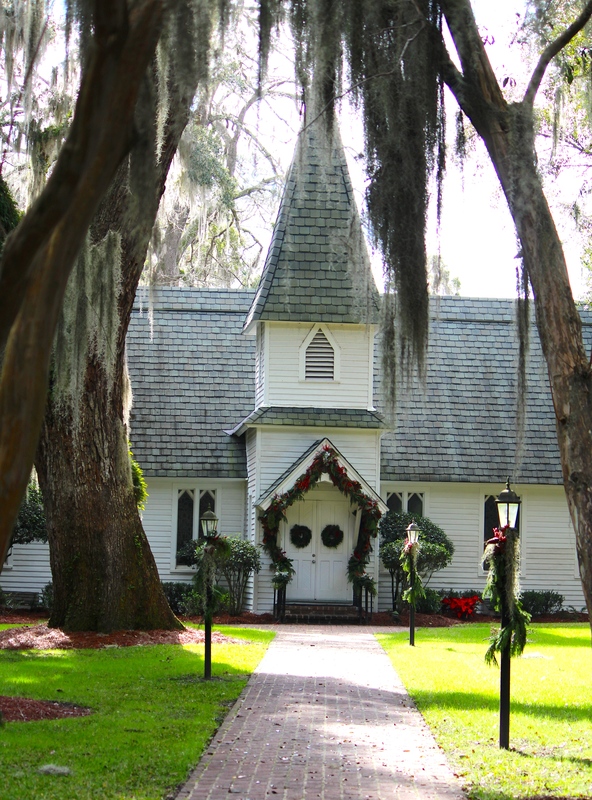 Surrounded by trees draped with delicate Spanish moss, Christ Church, an active Episcopalian congregation, is a tribute to the work of brothers Charles and John Wesley, those involved in the initial building in 1820, and those who reconstructed it after Union forces damaged it heavily during the Civil War. The church that you can visit today is the 1884 rebuilt structure with beautiful stained glass windows, white facade, and elegant steeple. 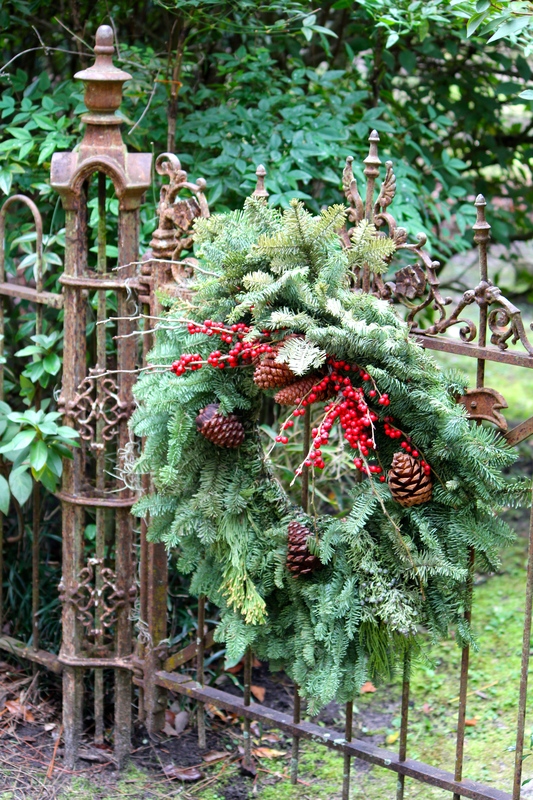 Visiting in early January, we were able to see the traditional, natural Christmas decorations on railings and fences as well as on the doorway. The cemetery is one of the oldest in Georgia, and often visitors want to see the grave of Eugenia Price, a noted local author (Beloved Invader, Lighthouse, New Moon Rising) who arrived with the notion she would write for a while in St. Simons but then fell in love with the area and became a permanent resident. Across the road from the church is Wesley Gardens, a two-acre plot filled with over 60 varieties of shrubs and native plants. The centerpiece of Wesley Gardens — a towering 18-foot Celtic cross of Georgia stone — pays tribute to the work of the Revs. Charles and John Wesley. We loved our time at both Wesley Gardens and Christ Church — a time to stroll quietly and almost alone. A time to reflect among the towering trees and along the peaceful walkways. It was a different feel to a coastal town experience. You leave the beach behind and just appreciate the almost silent time away from it all — a good thing on anyone’s Things To Do vacation list! 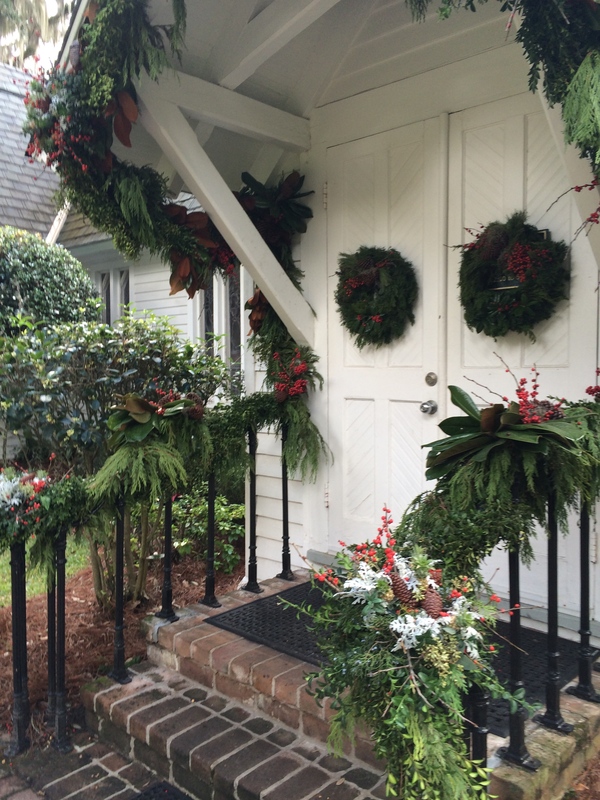 Christ Church Tour of Homes (62nd annual event) will be held March 21, 2015. For information, click here. Website with information on Wesley Memorial Gardens and Christ Church and Cemetery: ExploreSouthernHistory.com. Church can be visited Tuesday through Saturday from 2 PM to 5 PM. Cemetery and grounds can be visited sunrise to sunset Tuesday through Sunday. 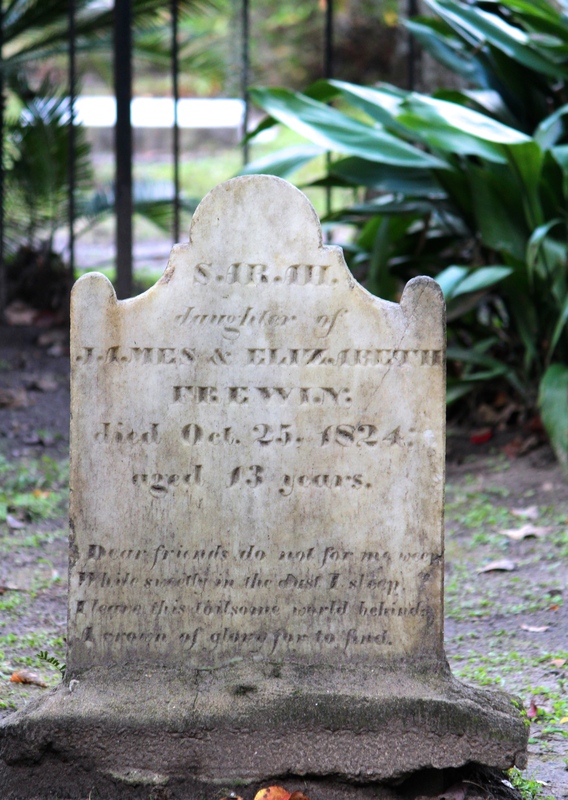 To view Wesley Memorial Gardens — park at Christ Church on Frederica Road and walk across the street. This entry was posted in Georgia and tagged cemetery, Charles Wesley, Christ Church, Christ Episcopal Church, Georgia, John Wesley, St. Simons Island, Wesley Gardens, Wesley Memorial. Bookmark the permalink. Thank you for the post, many beautiful pictures. For more information about the early Methodist leaders, I invite you to the website for the upcoming book series, The Asbury Triptych Series. The trilogy is dedicated to the leaders of the early Methodist movement in England and America as told through the life of Francis Asbury. The opening book, Black Country, does something completely unique by detailing the early preaching circuits of Francis Asbury in England before leaving for the American colonies. The website for the book series is: http://www.francisasburytriptych.com. Again, thank you for the post. Thank you so very much for this information. We are Methodists and interested in the early movement in America. Your book series sounds quite interesting. Best wishes to you for much success in spreading the word about early Christian efforts in America. We loved the Christmas decorations also. Natural and tasteful. Just pine boughs, red berries and ribbon. Why can’t I do the same here???? You’re right about Spanish moss being a Southern icon — we’ve seen it just about everywhere from LA to SC. Glad the post triggered a memory for you. Really enjoyed the tour of this special place with wonderful stories. Thanks, Rusha! Thanks so much, Amy. It was a pleasant experience being there and then reading more about it! I love your way of thinking — “when you come back . . . ” I asked Bert if we could go to the Home Tour and see the azaleas. He’s thinking about it. We just may get that chance. I’d love to do that. AND take a tour of the interior. So glad Brian introduced us to each other. He is one of the finest men I know, and we love being close to them one week out of the year — our week at Pawleys!!! Beautiful! Thanks for the bit of history, I had no idea that the Wesley brothers ministered in the states. It was fascinating to see the front view of the church then read that it had been rebuilt in 1884. The Friends church I attend, built in 1894 looks much the same. The entry, roof line, bell tower, tall windows and wide sanctuary. Except it’s much smaller. Wanda, I learned a lot by searching the internet. Didn’t know about the Wesley brothers either. They were at Fort Frederica (my next post in this series) ministering to the folks there. Would love to see The Friends church you mentioned. Where do you live? I had a peaceful walk through Christ Church’s cemetery in November; it and the simple white church make for a very serene place indeed! It seems that the folks I know who have been there all have the same impression. Perhaps we ought to apply for jobs at places like that. Our stress just might go away! Thanks for reading and commenting. Good photos; like the framed one of the door best. Thanks so much! Taking pictures of pretty places make my photos look even better! We loved this sweet place — could go back! Appreciate the comment.